When you wear this Rosie the Riveter Pin, you'll know you are showing the strength of women, the "We Can Do It!" women who helped America win World War II. In the famous Rosie poster, she wears an employment badge for Westinghouse Electric Service on her collar. That's because J. Howard Miller, the artist who drew the poster, worked in that factory. NOTE: We now have a 22" 100% cotton Rosie the Riveter bandana as an add-on to our authentic Rosie button. We've researched the pattern of Rosie's bandana and are offering it to you for just $5 when you purchase our Rosie the Riveter Button. You'll see this add-on option when you put the Rosie button in your cart. For the $5 add-on you get the same 22" bandana that we sell for $12. WANT SOMETHING MORE OFFICIAL? A COLLECTIBLE ROSIE COLLAR PIN? We also have a Rosie the Riveter Employment Pin as a collectible three-dimensional metal pin with hand-applied enamel. 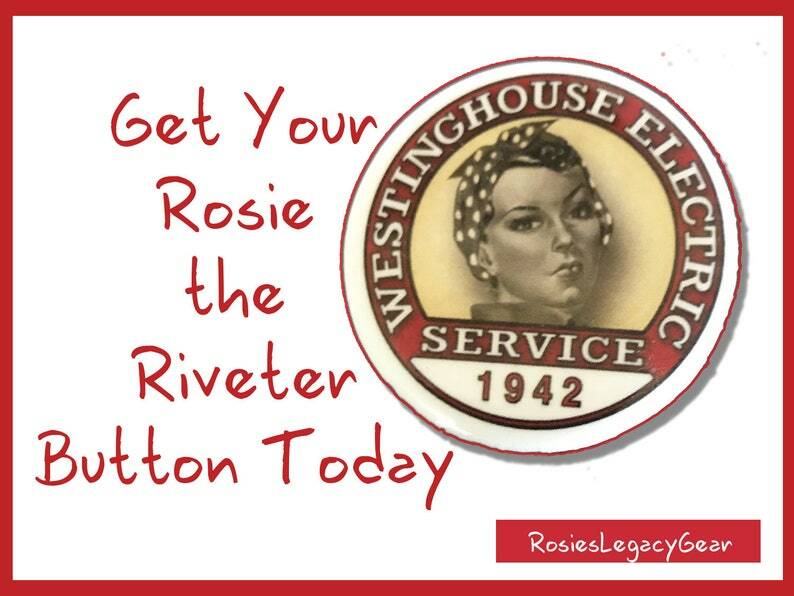 We've sold authentic 3-dimensional replica Rosie Pins for a number of years and they continue to be one of our bestselling items with rave reviews. However, this year we decided to introduce this lower-priced pinback that offers the same well-researched design but as a button. EITHER WAY -- authentic metal Rosie Pin OR Rosie Button with same design on anti-glare weather-resistant finish, we know you'll be pleased with the design and value. If you need 10 or more buttons for a party or event or want to resell our Original Rosie Legacy Employment Badge Button, start a convo with us. We can accommodate your needs. RosiesLegacyGear was our first etsy store. We're so grateful to all of our customers for making this a big success. We started this store after publication of our collective memoir, ROSIE’S DAUGHTERS: The “First Woman To” Generation Tells Its Story. Over time, we have added more store and we invite you to check them out. SHIPPING: We ship within 1-3 business days.